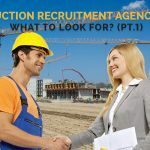 Construction Recruitment Sydney – The HLH Way! 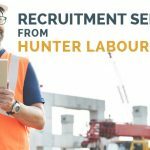 At Hunter Labour Hire we now offer construction recruitment services for permanent roles in addition to our temporary labour hire services. We have a vast and constantly growing database of workers with experience in working in all facets of construction and civil sectors. 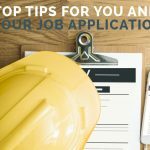 If you are looking to hire a new project manager, contract administrator or even a Health and Safety Co-coordinator then let our expert recruitment consultants find the right candidates for you. Using the HLH Recruitment process we can tailor how we do things to suit the specific needs of all our clients. We have a comprehensive recruitment process in place to ensure that the quality of the workers we supply is always to the high standard that our clients expect. We only consider applications from people with the necessary qualifications in their trade, adequate work experience and a valid white card. We receive a request from our clients regarding a vacancy that they require our assistance on. We will ask our client for a job specification and also ask a number of questions to ensure we fully understand the role the client wants to fill. Once we are confident we know what our clients require we will conduct a keyword search of our extensive database to see if we have suitable workers already on our books. If we do not then we also have access to a variety of avenues in which we can advertise for the vacancy both on our own job board and others, through our active social media channels and even through own contacts and network that we have built up substantially over the past couple of years. Once we have identified the right candidate we will reach out to them and inform them of the vacancy, while also conducting initial phone screening. All going well at this stage candidates will be invited to our office for an interview and they will complete our registration process. Online Registration – All applicants must complete our online registration form which captures data about their previous experience and referee details in addition to payroll and personal details. Face-to-face interviews – Once we are satisfied with the outcome of an initial phone interview we then invite the candidates into our city office for a face-to-face interview. This gives us an opportunity to gain further information from the candidate about their relevant experience. Document Check – We complete a document check to ensure all relevant tickets and/or licences are in date and compliant with SafeWork NSW requirements. We have relationships with numerous Registered Training Organizations and can arrange for suitable candidates to gain the required skills and training they may need for potential roles. Visa Check – We ensure all candidates from overseas have a valid visa by conducting VEVO (Visa Entitlement Verification Online) checks. Once we are happy with our candidate we will arrange an interview with our client so that candidate and client can meet to ensure that they are good matches for each other. Following a successful interview between client and candidate we will conduct reference checks. We carry out reference checks with previous employers to verify the candidates experience and period of employment. We can provide completed reference checks to all clients. Once a candidate has successfully passed through the above stages they will receive a job offer from our client and will then join their team. Our recruitment consultants job does not finish here. They will be in touch with the client and candidate over the coming days and weeks to ensure that all parties are happy with the placement. 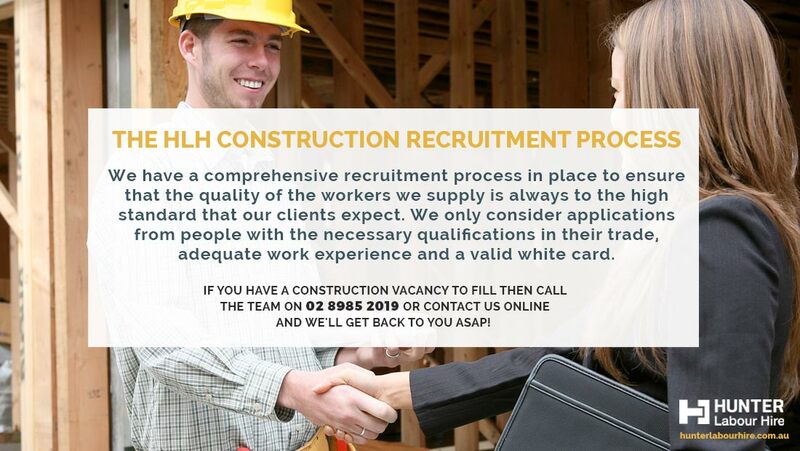 Does this sound like a recruitment process that could assist your company filling any existing construction vacancies? Don’t worry the experienced HLH recruiters will find the right candidates for you. 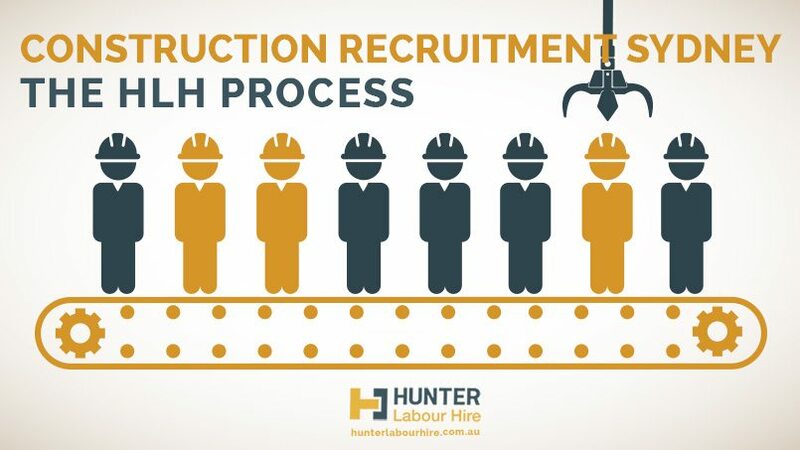 Get in touch with the Hunter Labour Hire team on 02 8985 2019 or fill in our online contact form and we’ll get back in touch with you as soon as possible!